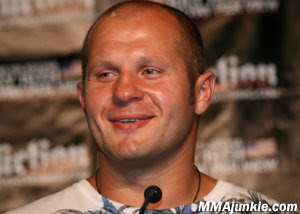 ANAHEIM, Calif. - For a brief moment during Saturday's "Affliction: Day of Reckoning" main event in Anaheim, Calif., Fedor Emelianenko (29-1) looked almost human. Apparently frustrated by the effective striking, long reach and rapid speed of challenger Andrei Arlovski (14-6), Emelianenko looked wounded in the corner, and "The Pitbull" smelled blood. The suddenly, and with little warning, a crushing right hand flattened Arlovski and immediately returned Emelianenko's mystique. During the psot-event press conference, the Russian champion said that despite appearances, he was firmly in control throughout the 194 seconds he needed to destroy the world's second-beat heavyweight. "I didn't really think that I was really in any danger in the fight," Emelinaneno said through an interpreter. "I like to feel that I felt -- not only usually, but particularly in this fight -- felt comfortable and OK with where I was during the fight. I just didn't feel that I was in any danger." Arlovski looked to be the quicker man in the opening minutes of the contest, peppering Emelinaneko with crisp jabs and leg kicks. The 32-year-old admitted Arlovksi's speed was impressive, but said it was not overwhelming. "I didn't really feel like I had that much trouble in there," Emelianenko said. "I really felt comfortable, and I felt his speed. Yes, he is fast. But I didn't really feel that I was having trouble finding range. "He's got very quick hands. He's got great skill. But I felt after a while that I was able to counter his attack and felt comfortable in there." Emelianenko closed the distance on one occasion, clinching with Arlovski in the Belarusian's corner of the ring. A spot that "The Last Emperor" has used countless times before to drag his opponent to the mat looked strangely ineffective as Arlovski out-muscled Emelianenko's advances -- or so it seemed at first glance. "At that time I wasn't trying that hard to throw him down," Emelianenko said. "I was really trying to wrestle a little bit at that time." Then the former UFC champion tagged Emelianenko with left-right combo, followed by a front kick. Arlovski had his opponent on the ropes -- literally and figuratively -- and he charged in to finish Emelianenko off and reserve his spot in the record books. Only Emelianenko wasn't in on the plans. "I just think he made a mistake," Emelianenko said. "I saw on opening and my automatic reaction was to throw the right hand." The opening was a result of a reckless flying knee attempt by Arlovski, and the automatic reaction by Emelianenko left his opponent unconscious on the mat. "For that [flying knee] of Arlovski's, we didn't really train or prepare for that particular move," Emelianenko said. "But there are certain scenarios that we prepare for based on what's going on in the ring. In that situation it was basically an automatic response. "There are certain situations that we do train for, and that was my automatic response to the counter." Emelianenko has now won an astounding 26-straight bouts. The knockout marked his second-straight destruction of a former UFC champion, and the result cements Emelianenko's position as the world's best heavyweight fighter. And while some observers point to Arlovski's defeat as a moral victory of sorts, proof that the Russian does have some small strain of vulnerability, Emelianenko believes he was never behind on his path to a convincing -- and impressive -- WAMMA heavyweight title defense victory. "Honestly I haven't seen the fight yet, but I felt based on just feeling myself in the ring, I felt it was an even fight -- up until the point I knocked him out."